World Rally Champion Sebastian Ogier’s victory in the 2014 Monte Carlo Rally in a Volkswagen Polo R was Ogier’s first at Monte Carlo and the first for Volkswagen. First victories in the world’s oldest and most famous rally have lifted countless drivers to prominence—and presaged record-breaking motorsport success to come for manufacturers including Mini, Lancia and Audi. Another example of this was the back-to-back victories won by the Swede Erik Carlson driving a SAAB 96 in the 1962 and 1963 Monte Carlo Rallies. Carlsson—who also married Sir Stirling Moss’s sister, Pat, in 1963—went on to gather a worldwide following as a rallying legend. The Monte Carlo victories weren’t a bad thing for SAAB, either. The company was founded in Trollhattan as Svenska Aeroplan AB (SAAB) shortly before the beginning of WWII to build aircraft for the Swedish Air Force. A variety of military and civil aircraft were produced at Trollhattan throughout the war and aircraft production continued following the war. SAAB’s first automobile was shown to the press in 1947, but pilot production of just twenty cars didn’t take place until mid-1949. 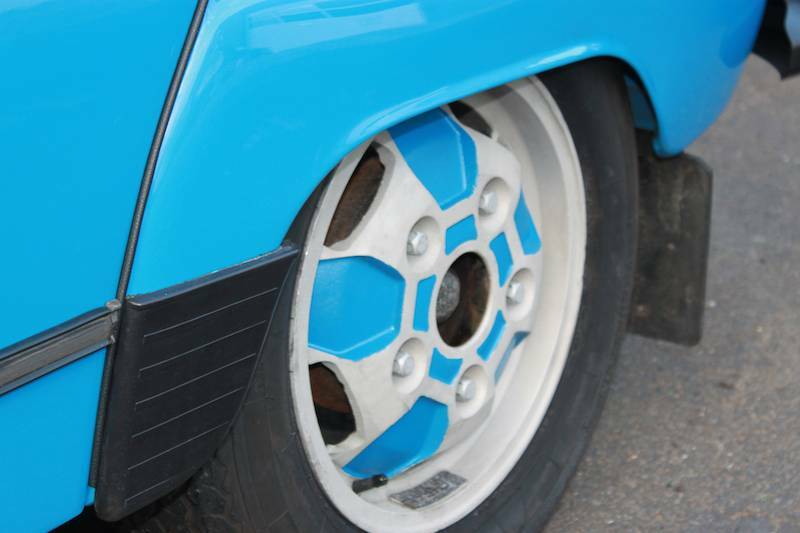 The new car was designated as the SAAB 92, powered by a 2-cylinder two-stroke engine based on a DKW design. The 92 utilized a unibody structure with front wheel drive. The aerodynamic shape of the body clearly originated from SAAB’s aircraft wind tunnel. But the shape was painfully plain in the emerging post-war automobile market. The updated SAAB 93 was announced in 1955, with a 748cc 3-cylinder two-stroke engine and a redesign to only the front of the car that defined the visage of the sturdy sedan until production ended in 1979. The design was updated again in 1960 as the SAAB 96 with the most notable visible update being nothing more than a larger rear window. The 3-cylinder two-stroke engine displaced 841cc and produced 38hp in stock form. It was with this car as a starting point that SAAB and Carlsson upset the best rally cars and teams in the world in the Monte Carlo Rally in 1962 and 1963. The unusual 3-cylinder two-stroke SAAB engine was only put out to pasture after SAAB began offering a 1,500cc V-4 engine in 1967. 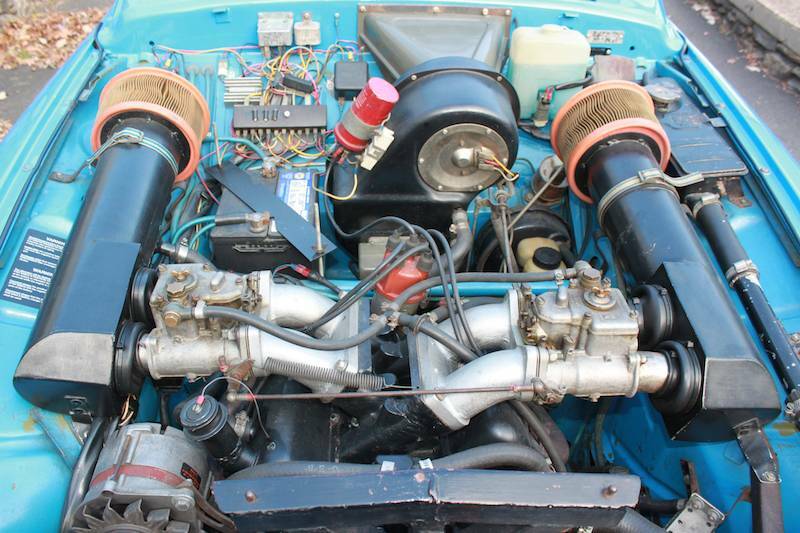 Ford originally designed this engine in 1962 for the European Ford Taunus. Erik Carlsson retired from competition at the end of the 1970 rally season and became an ambassador known as “Mr. SAAB” throughout the world. 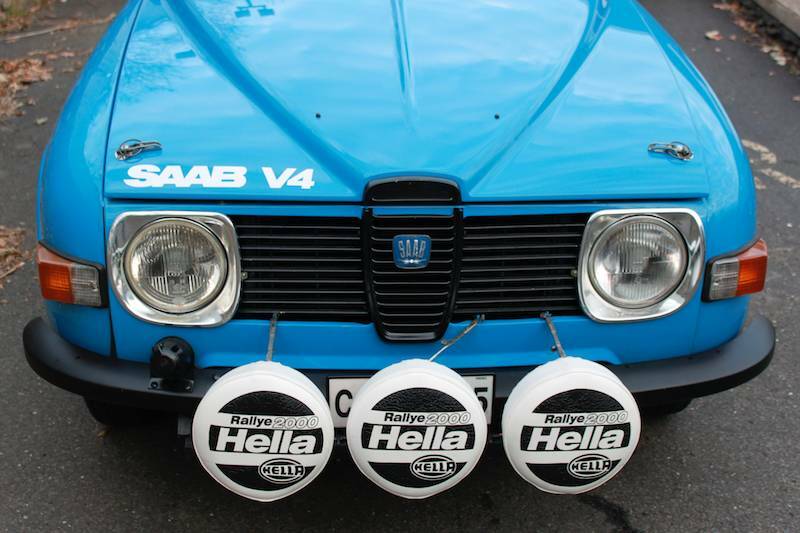 The enthusiasm for his epic drives in underpowered, and perhaps odd-looking, Swedish cars also carried on. 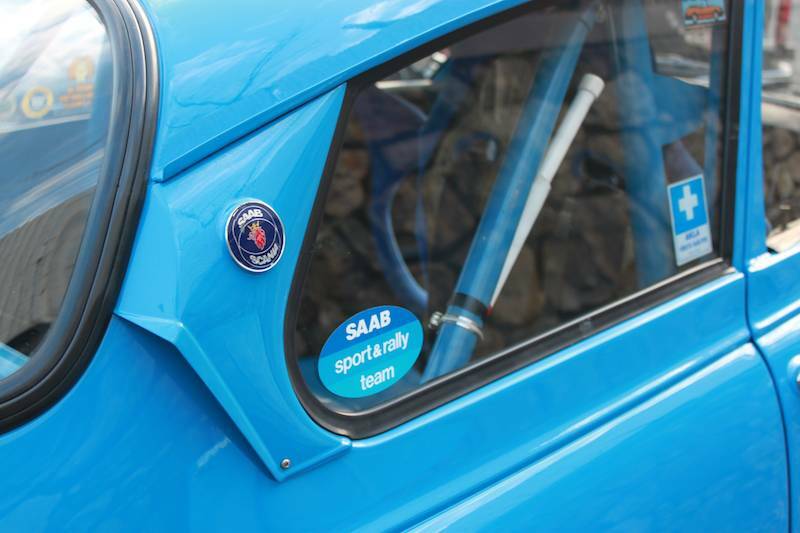 This 1970 SAAB 96 rally car was constructed in Sweden in the 1990’s as a correct replica of a V-4 rally car from the period, other than modern safety equipment. The car has been recognized by the FIA as a Group 2 touring and rally car. 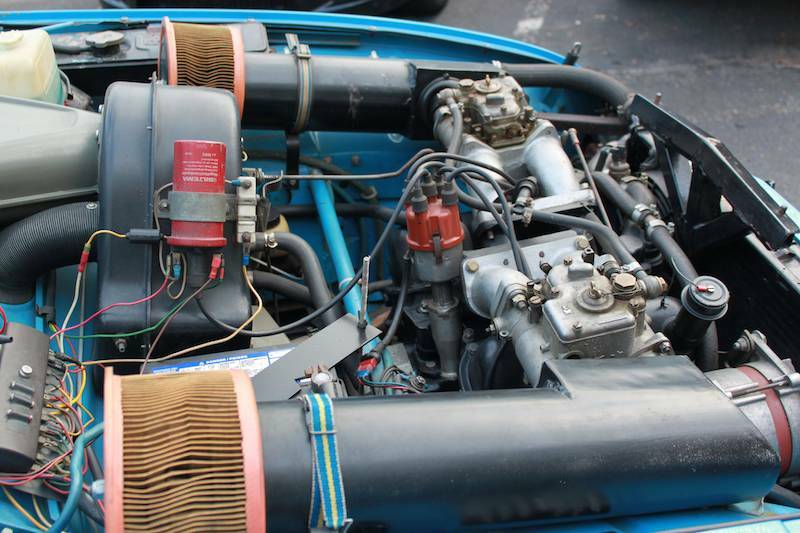 The engine in the car is an 1,850cc version of the V-4 engine with two sidedraft Weber 45DCOE carburetors and many rare parts, also according to Lamb. 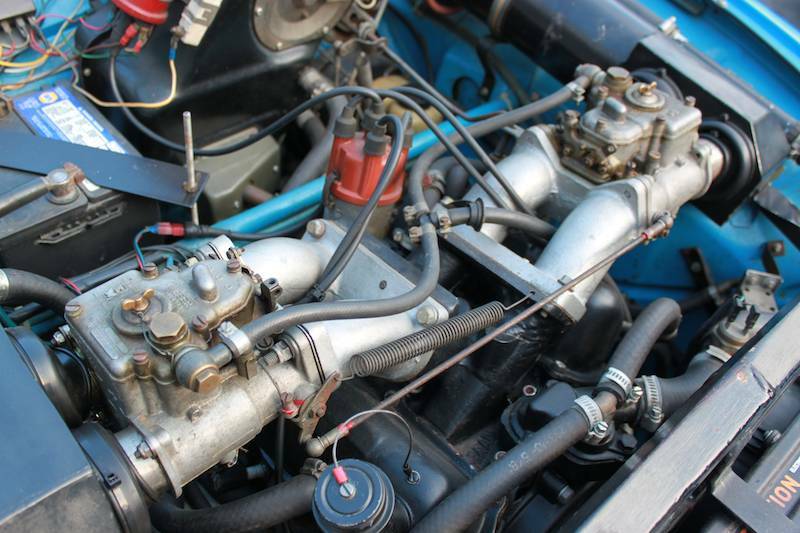 The engine was built by SAAB engine specialist Bengt-Erik Strom who previously built engines for later SAAB factory drivers the likes of Per Eklund and Stig Bloomqvist. The power is estimated to be 145-150hp at the front wheels through a close-ratio gearbox and limited slip differential. 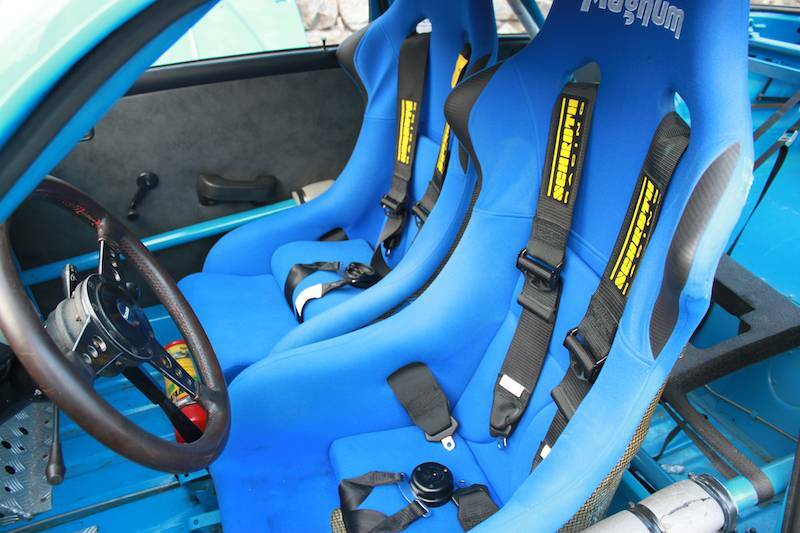 Settling into the modern-style racing seat and five-point safety harness, the driver and passenger are surrounded by a full roll cage. The floor is bare metal, painted the same shocking blue as the exterior. If Pepto-Bismol came in blue, this would be the shade. Fire extinguishers are mounted at the base of both the driver and navigator’s seats. 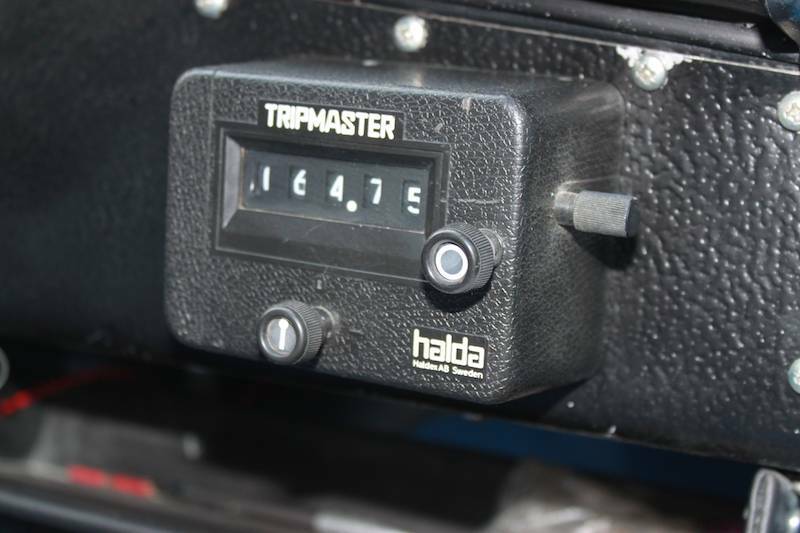 The dashboard and controls reflect the production car origins, with the addition of a tachometer located just above the center of the steering wheel, large fuel and ammeter gauges, and a vintage Halda Tripmaster mechanical rally gauge. The SAAB starts easily and moves away with a minimum of fuss. Some of the controls might take a bit of time for a modern driver to adjust to. 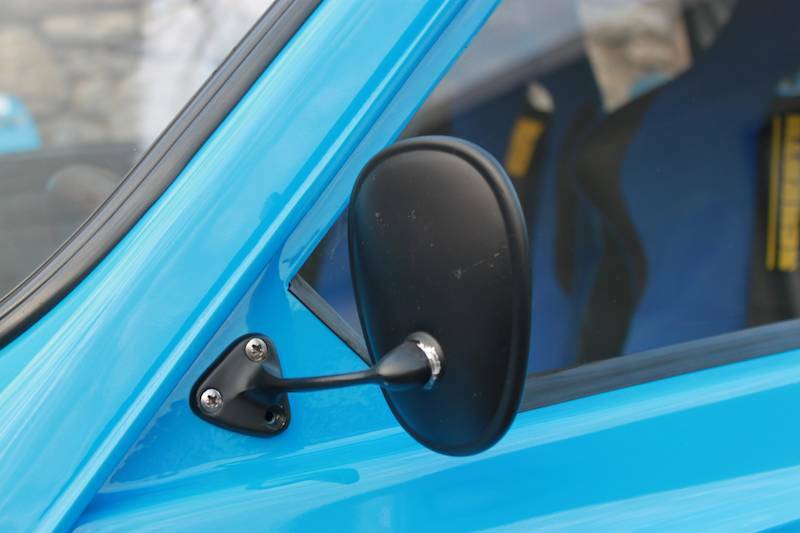 First, the four-speed transmission is shifted by a lever mounted on the steering column. 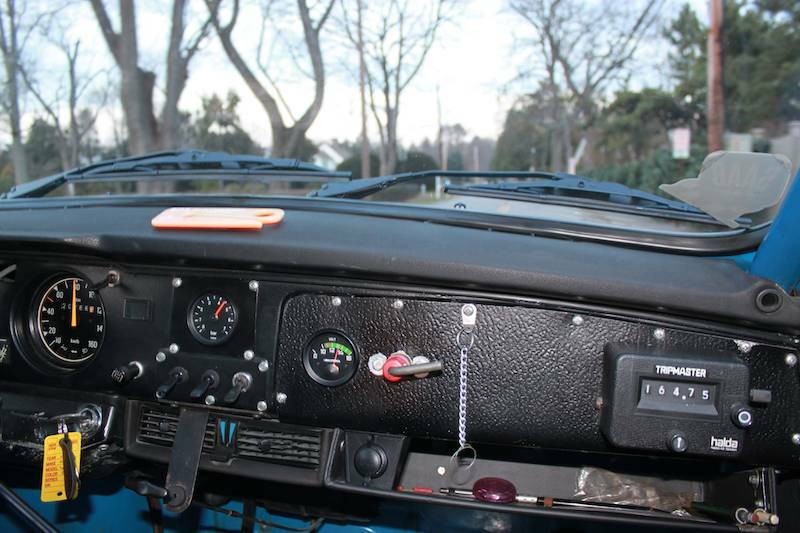 And then there is the freewheeling feature operated by a pull control below the dashboard. 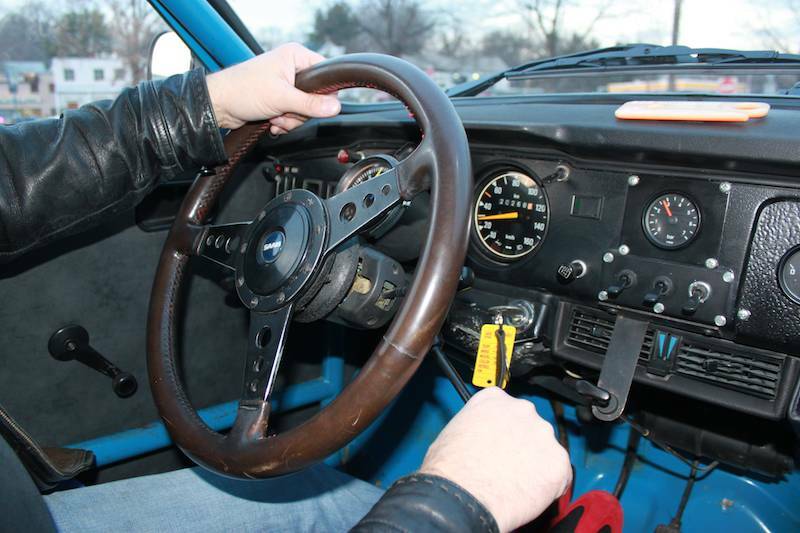 Freewheeling disengages the engine and transmission from the driveshafts when the wheels are travelling faster than the engine is turning—as when the boot is lifted off the throttle to shift while the car is traveling downhill at speed. Freewheeling was absolutely necessary for the early two-stroke SAABS, where the combination of engine revs driven by the front wheels and a lack of fuel/oil mixture from the throttle to lubricate the cylinders could quickly cause catastrophic engine damage. 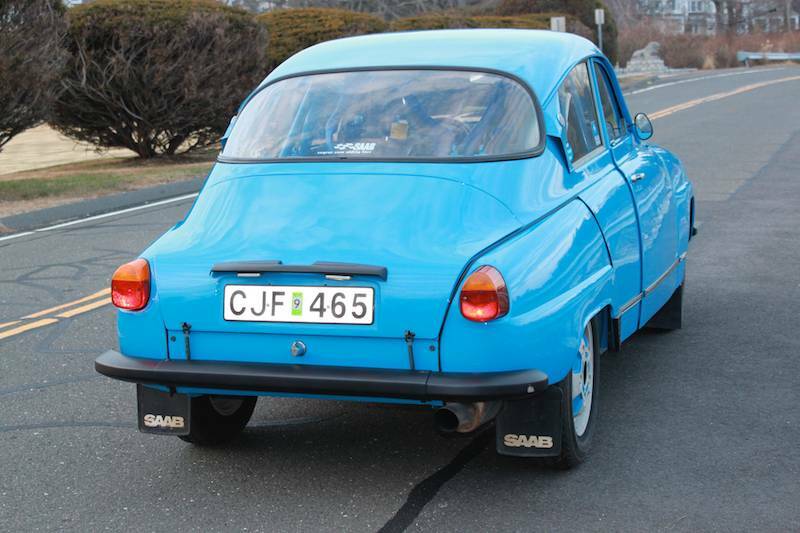 SAAB continued the use of freewheeling with the SAAB 96 V-4 and the later SAAB 99 as a fuel saving measure. On the road, the car feels solid and surprisingly sporty for its outward appearance. The V-4 engine revs easily up to 7,000rpm filling the bare cabin with a bellow overridden only by the whine of the limited slip differential. 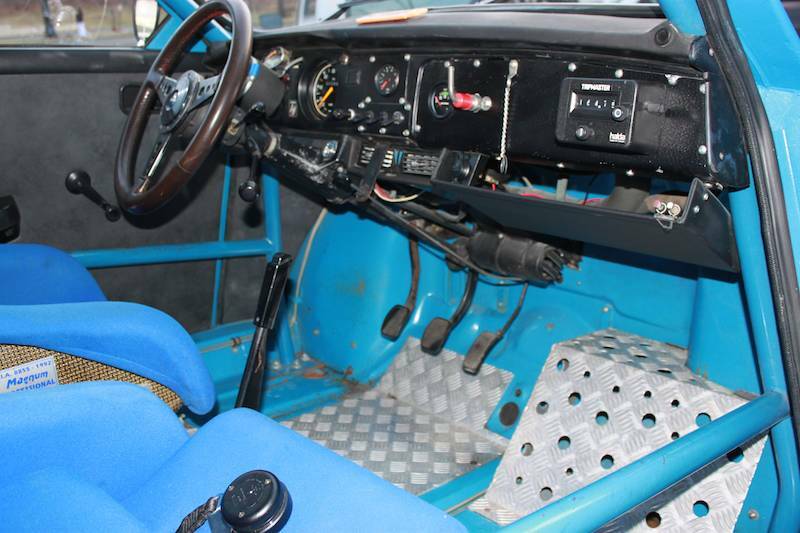 Steering is very heavy, also owing to the limited slip diff and front wheel drive. Speeding down the road—with trees racing past on both sides—while the driver wrestles with the throttle, clutch, column-mounted shifter and the freewheeling control, the navigator feels relatively secure in the tight, solid confines of the cabin. 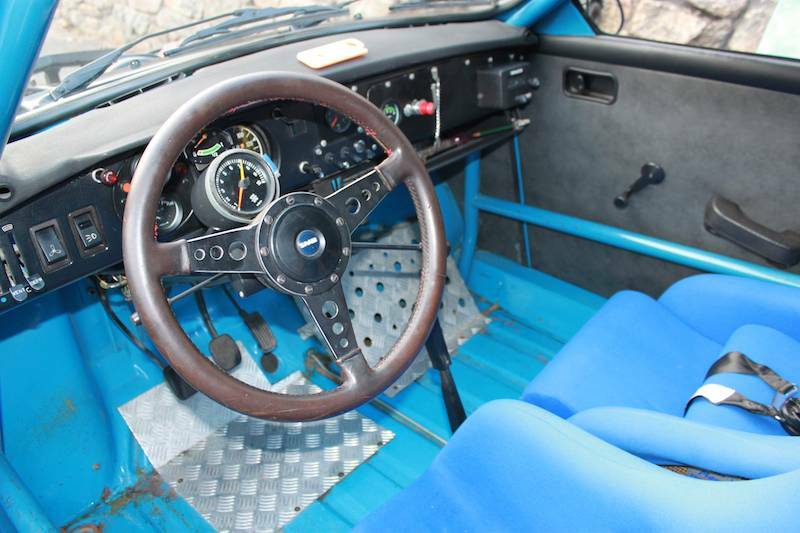 With the increasing popularity of historic rallying and the scarcity—not to mention stratospheric value—of the few remaining original SAAB rally cars, this looks just the way to go if you interests run toward keeping up with the Carlssons. Take good care of it and once you’d plan to divorce from it, just let me know!